Stretch 4 Life has long been a proponent of eating good food to fuel the body, and kickstarted the S4L Fresh Air Market last year with hopes of inspiring others to eat farm fresh food straight from the garden. This year, S4L has recently acquired its first hydroponic tower garden to add to the Fresh Air Market, and we have enjoyed watching the plants grow day by day. We love listening to the water trickle through the levels of pots, sounding like a waterfall and adding to the clinic’s relaxing atmosphere. We are also very pleased with how well the plants are doing, even though there is very minimal care involved. Most of all, we look forward to eating the delicious, fresh fruits and veggies as they become ripe for the picking. The past couple of weeks, we have received many questions from our clients about how to grow a tower garden. 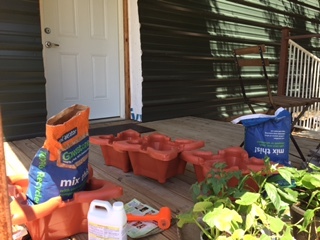 While Stretch 4 Life is not an expert on the topic of tower gardens, by any means, and is more familiar with traditional gardening in the soil, we have decided to share our journey with the tower garden thus far. Hopefully, some of the questions we have received will be answered along the way. MATERIALS: Stretch 4 Life purchased a “Grow Up Hydrogarden” which included 5 square pots, a 20-gallon reservoir tub w/ lid & cap, a submersible pump with plumbing tubes, a bag of large hydroponic growing medium, a bag of small hydroponic growing medium, a plant dolly, and a container of hydroponic nutrients. 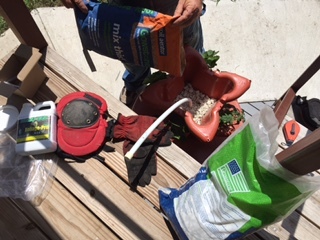 All we needed to have with us was an electrical outlet, 15-20 gallons of pond water, and plants at least 3″ tall (max of 20 plants). SETUP: The hydrogarden plants needs to have direct sunlight for at least 6 hours every day. Since the location we picked for the garden was partially shady, Ed Walter built a “lazy susan” turntable for the tower to sit on. All we have to do is give the garden a 1/4 turn every so often to allow all the plants to have time in the sun. Other than that, everything else was straightforward. 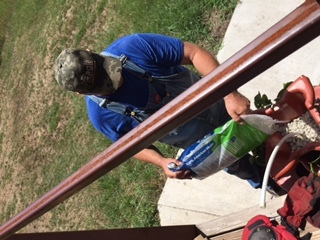 The plumbing tubes were attached to the pump and placed in the center of the 20-gallon reservoir tub. The lid was placed on top and the tube was inserted through the lid. Next, we slid the largest pot down the tube until it rested on the reservoir lid. Ten to fifteen cups of the large hydroponic growing medium was added into the pot first, followed by about 4-5 cups of the small hydroponic growing medium. 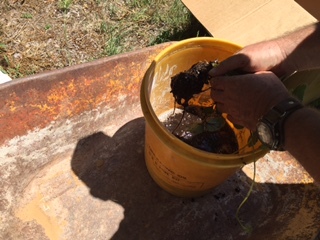 ADDING PLANTS: Each plant needed to be rinsed thoroughly until all the soil was washed off. The soil will wear the pump down quicker and/or clog it up, so the more soil that can be washed off, the better. The instructions also suggested soaking the roots overnight in a bucket of water for best results. The plants were placed in the pots at an angle in the corners and more of the small hydroponic growing medium was added to cover the roots. This process was repeated for the remaining pots, and that was it. So simple! FINAL PRODUCT AFTER 2 WEEKS! 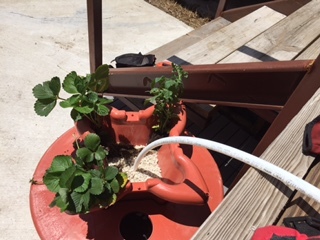 We already have a small strawberry and a bell pepper growing. 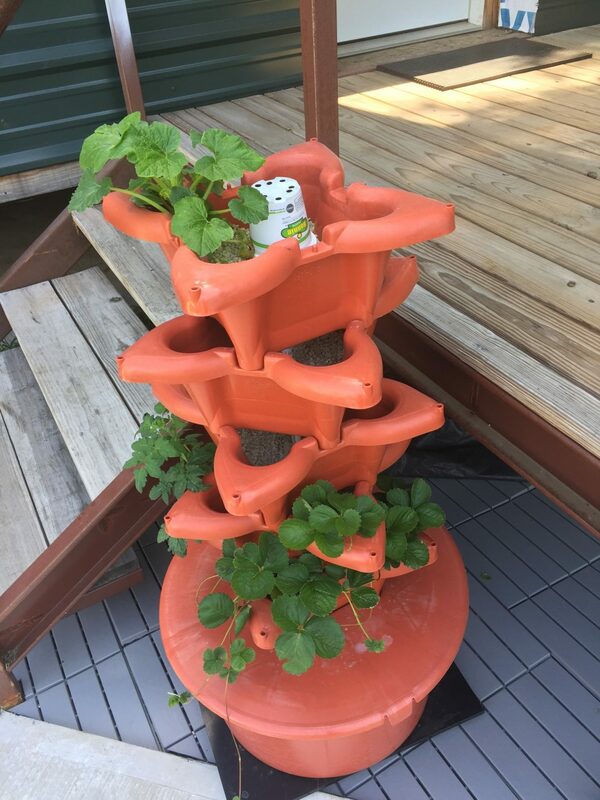 This was an easy project to assemble, and with how well the plants are growing so far, we would recommend a tower garden to anyone and everyone. Stay tuned for Part 2 of How To Grow Your Tower Garden where we will update on our garden’s progress, discuss how plants grow in a hydrogarden, and share any tips that we have picked up along the way. Until then, eat well!